Latham Engineering Africa (LEA) specializes in the design and build of tanks and process equipment in stainless steel and other exotic materials. The engineering design team has a combined experience of more than 30 years in design, build and project management in the food, dairy, pharmaceutical and industrial industries. Together with our experienced workshop staff of boilermakers and welders LEA ensures that all work is designed and built in house to ensure all work is undertaken with utmost care and precision. Based in Johannesburg we have experience in delivery and on site execution throughout South Africa and Sub Saharan Africa. LEA concentrates on all aspects of cutting, forming, machining, welding and finishing of austenitic and high alloy stainless steels as well as pure nickel and titanium. LEA is also able undertake repairs and modification of existing equipment on site or at our workshops. LEA concentrates on all aspects of cutting, forming, machining, welding and finishing of austenitic and high alloy stainless steels as well as aluminum, pure nickel and titanium. We also undertake repair of existing plant and equipment. Our experienced designers are available to meet customers’ specific requirements. Our Quality Assurance is in-house and on the job aided by strict document control, traceability and Third Party or client inspection when required. We adhere to IS0 90001 standard of tank manufacturing. Latham Engineering Africa manufactures quality asceptic tanks. 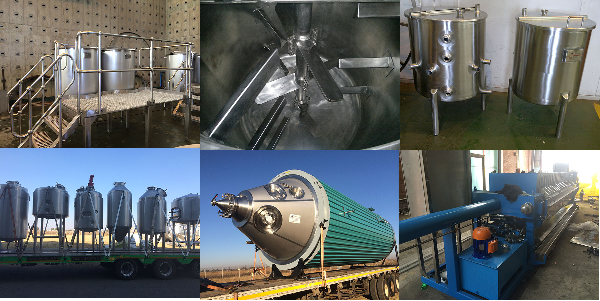 Latham Engineering Africa manufactures quality brewery tanks. Latham Engineering Africa manufactures quality carbon and sand filters. Latham Engineering Africa manufactures quality dairy tanks. Latham Engineering Africa manufactures quality fermenters. Latham Engineering Africa manufactures trucks tankers. Latham Engineering Africa manufactures mixing tanks. Latham Engineering Africa manufactures filter presses. Latham Engineering Africa manufactures jacketed - insulated tanks.